Pakistani gunmen have torched five NATO trucks carrying equipment out of Afghanistan as the alliance’s international forces withdraw from their combat mission in the country after 12 years of war. 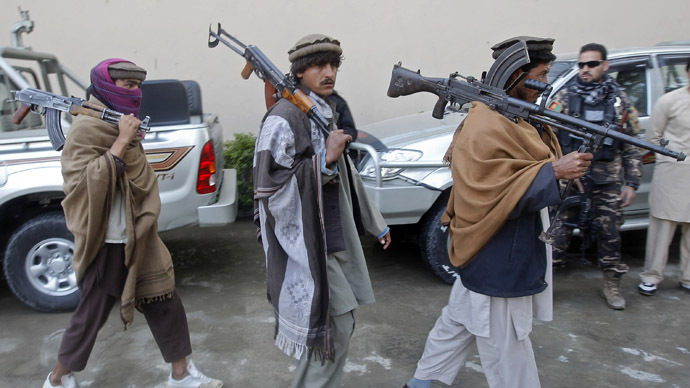 Four masked gunmen on two motorbikes attacked NATO vehicles in the southwestern Pakistani province of Baluchistan, forcing them to stop after leaving Afghan territory. Attackers then poured gasoline onto the trucks and set them on fire. "Five NATO trucks were carrying NATO equipment back. 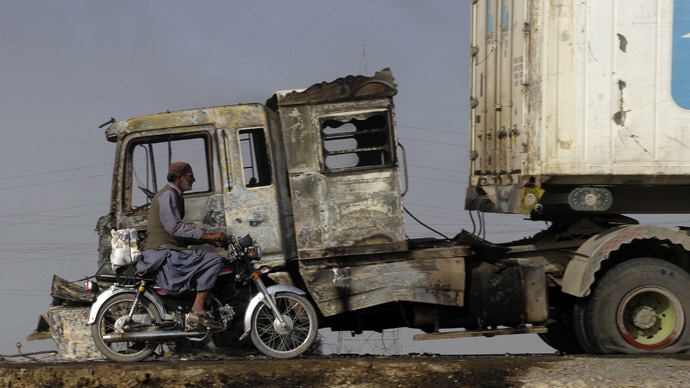 Gunmen first fired on the first vehicle and then sprinkled petrol on all of them," AFP quoted senior Pakistani Iftikhar Bugti as saying, who added that one of the drivers sustained minor injuries and all five trucks were completely destroyed in the fire. No group has yet claimed responsibility for the incident; the attackers fled the scene before security forces arrived. 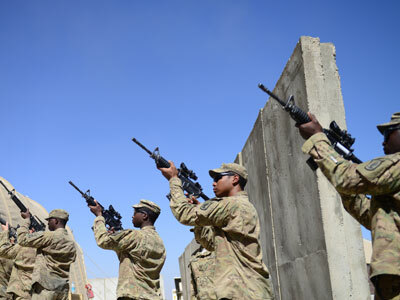 The withdrawal of military hardware and vehicles from Afghanistan comes as a part of US President Barack Obama’s decision to remove 34,000 American troops from the country within one year. The US military officials said Sunday that the “retrograde from Afghanistan” will cost between $5 and $6 billion. Some 25,000 vehicles were shipped out of Afghanistan over the last year; another 25,000 remain in the country. 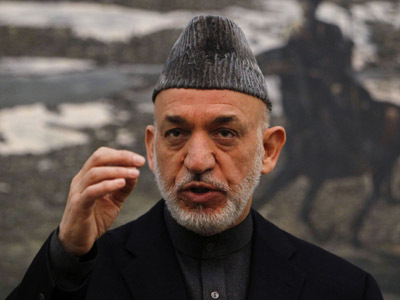 Relations between Washington and Islamabad worsened in 2011, significantly complicating NATO’s military mission in Afghanistan. The alliance was forced to use alternative routes to deliver supplies – from the north, through Russia and Central Asian countries – which has been twice as expensive as transport directly through Pakistan. In July 2012, Pakistan pledged to reopen crucial supply routes for NATO-led forces in Afghanistan. The agreement came after the US apologized to Pakistan for killing 24 of its troops. The US hopes to save hundreds of millions of dollars with the reopened routes as it begins withdrawing from Afghanistan.